The Telecom Regulatory Authority of India today came down heavily on the reported threat of cellular service operators that they will prosecute the regulator for initiating consultations on the unified licence regime. India’s exports are likely to clock a 14 per cent growth in the first quarter of the current fiscal year, a top Commerce Ministry official has said. The Director-General of Foreign Trade, Mr Lalit Mansingh, said exports could cross the $ 13 billion mark during the quarter ended June 30. HDFC today registered a 22 per cent rise in net profit at Rs 167.76 crore during the first quarter ended June 30, 2003 as compared to Rs 137.3 crore recorded during the corresponding period of the previous fiscal. The Securities and Exchange Board of India today asked mutual funds industry to grow their investor base by expanding in rural areas even as it warned them not to run some of their schemes as portfolio management entities. The economy was doing well with enough liquidity in the system and this situation could be used to expand investors base. Hyundai Motor India is investing $ 200 million to expand production capacity by one lakh units to 2.5 lakh cars and introduce new models like the premium hatchback car ‘Getz’ and luxury sports-utility-vehicle ‘Terraccan’. The company has, however, ruled out any immediate plans for an initial public offer (IPO). 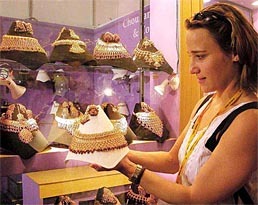 A foreigner admires jewellery designs at the India International Jewellery Show, in Mumbai on Friday. Y. Venugopal Reddy, currently Executive Director of International Monetory Fund will be the new Governor of Reserve Bank of India, succeeding Bimal Jalan. Employees of the Punjab State Cooperative Agricultural Development Bank, including employees of the Punjab State Cooperative Bank, held gate rallies in front of their offices here today in protest against the anti-employee policies of the state government. Disappointing the markets, IT major Wipro Limited today reported a 9 per cent dip on a quarter-on-quarter basis in net profit at Rs 206.1 crore and a 3 per cent drop in revenues at Rs 1,198.9 crore for the quarter ended June 30. Dabur India has drawn up a detailed brand blueprint for 2003-04 which includes extending ‘Vatika’ to skincare and soaps and Dabur Lal Manjan to toothpaste, besides launching a new shampoo and hair oils. The Telecom Regulatory Authority of India (TRAI) today came down heavily on the reported threat of cellular service operators that they will prosecute the regulator for initiating consultations on the unified licence regime. “I have read that cellular operators will prosecute TRAI for bringing out the consultation paper and I am surprised that an issue for consultation can bring out such strong responses,” TRAI Chairman Pradeep Baijal said while speaking at the Wireless India 2003 conference here. Mr Baijal said that TRAI would submit its recommendations by August 30 after due consultations with all concerned stakeholders. “It is not only bureaucracy who revels in consulting and in not going forward ...There are people in polity and economy who revel in looking back and looking sideways and not dealing with the issues in front of them,” he said. Mr Baijal, however, said that litigations were a healthy process. “There are litigations in every change and then the court gives a view. It is a healthy process’’, he said. In a consultation paper issued two days ago, TRAI has sought opinion of stakeholders on migrating from a service specific regime to a unified licensing regime, which is prevalent in a number of countries and has recently been mandated for the EU member nations. A unified licensing regime would enable service providers to offer both fixed and mobile services. “This would benefit the service providers and consumers, as there would be efficiency gains through synergies of infrastructure, networks and services,” a TRAI press release said. In India, the basic and cellular mobile services have been licensed separately. However, a certain amount of convergence in the terms and conditions of licence already exist such as both the basic and cellular service providers pay the same annual licence fees, both the service providers have common access to Universal Service Fund and can offer mobility. The TRAI consultations will cover entry fees, extent of mobility, roll out obligation, performance bank guarantee, and spectrum allocation procedure. Along with these, there are some other issues pertaining to interconnection, number etc, will also be discussed. Another issue on which the opinion of the stakeholders has been invited are the terms and conditions for consolidation in the industry and the need to have a guideline to check dominance in the industry. Mergers and Acquisition have been quite common in the industry over the recent years. However, intra-circle mergers, which are of a horizontal nature, have not been permitted so far. Creation of a unified licence would result in a larger number of players offering the same basket of services, and may lead to the need of allowing intra-circle mergers and acquisitions, the TRAI statement said. “The sectors include textiles, basic chemicals, pharma, engineering, automobiles ancillaries”, Mr Mansingh said on the sidelines of a conference organised by the Federation of Indian Export Organisations. Exports clocked double digit growth and grew by 13.53 per cent in May as compared to last year. Exports during May were valued at $ 4,520.93 million, higher by 13.53 per cent as compared to the export figure of $ 3,982.21 million in the corresponding month of the previous year. India’s exports during April and May this fiscal was valued at $ 8,863.59 million which is 11.12 per cent higher than $ 7,976.88 million in the corresponding period last year. 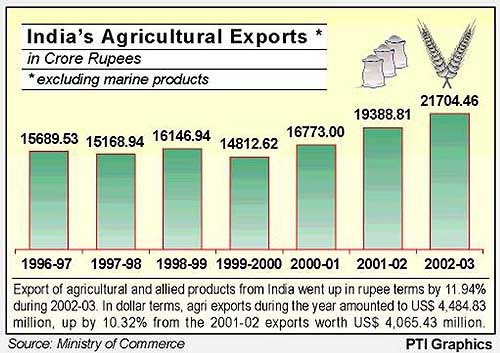 In rupee terms, the exports were Rs 41,858.94 crore during April-May 2003-04 which is 7.19 per cent higher than the value of exports during the same period last year. “Barring plantation sector, the other sectors have been doing well with some sectors even leading by 20-27 per cent growth. Noting that the export growth for 2002-03 was revised to 19.18 per cent from the provisional figure of 18 per cent, the DGFT said he was confident that India could well make it to one per cent share in world market ahead of the targeted year 2007. Income from operations rose to Rs 725.88 crore during April-June as against Rs 702.88 crore during the same period of the previous fiscal, a HDFC release said. Total assets of the company rose 19 per cent at Rs 26,782.69 crore during the quarter under review as against Rs 22,488.79 crore of the last year. Loan approvals grew 30 per cent during the first quarter at Rs 2,731 crore as compared to Rs 2,105 crore in the corresponding period last year. Loan disbursements also increased by 30 per cent during the period at Rs 2,092 crore as against Rs 1,607 crore in the first quarter of the previous fiscal. Approvals and disbursements in respect of individual loans increased by 35 and 34 per cent during the quarter ended June 30, 2003 as compared to the corresponding period in the previous year. HDFC’s deposit base stood at Rs 9,546.86 crore with the total number of deposit accounts exceeding 1.3 million. Syndicate Bank today reported a net profit of Rs 101.85 crore for the first quarter ended June 30, 2003, up by 28.26 per cent over the corresponding quarter of last fiscal at Rs 79.41 crore. Announcing the quarterly results, the bank said in a statement that owned funds increased by 12.84 per cent from Rs 1489.62 crore as on June 30,2002, to Rs 1680.95 crore on June 30, 2003. Capital Adequacy Ratio moved up from 12.71 per cent to 12.94 per cent as at the corresponding quarter ends. Earnings per share was at Rs 8.64 on an annualised basis compared to Rs 6.72 of the corresponding quarter of the previous fiscal. Finance to the housing sector touched an all time high of Rs 1717 crore, it said. The Securities and Exchange Board of India (SEBI) today asked mutual funds industry to grow their investor base by expanding in rural areas even as it warned them not to run some of their schemes as portfolio management entities. The economy was doing well with enough liquidity in the system and this situation could be used to expand investors base, SEBI Chairman G.N. Bajpai told reporters after a meeting with chief executives of MFs here today. The mutual fund companies could also enter rural areas to bring more investors into their fold, Bajpai said, adding the interaction was planned to seek feedback on working of MFs and issues concerning operations. SEBI sources said the issue of some funds having only few investors in some of their schemes came up for discussion. Though no specific scheme of mutual fund house was singled out at the meeting, it was made clear to CEOs that schemes could not be run as portfolio schemes for few investors as MFs had to be broad in character, they said. Hyundai Motor India is investing $ 200 million to expand production capacity by one lakh units to 2.5 lakh cars and introduce new models like the premium hatchback car ‘Getz’ and luxury sports-utility-vehicle (SUV) ‘Terraccan’. The company has, however, ruled out any immediate plans for an initial public offer (IPO), its Managing Director Jae II Kim said. “The total investment plan for the second stage of expansion is $ 200 million. We are increasing capacity to 2.5 lakh cars. 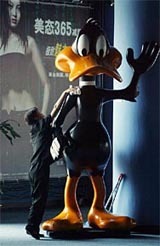 The construction work has started and will be completed by late 2004”, Kim said in an interview. The fresh capital investment would be made from internal accruals, he said adding that this would increase the company’s total investments to $ 900 million. “We have studied the possibility. Actually, we do not feel it necessary in terms of regulation or capital requirement to go in for an IPO for the time being. Maybe, when we need to expand capacity beyond 2.5 lakh units, then we may raise some money,” Kim said when asked about the IPO. The name of Reddy, a former Deputy Governor of RBI, has been cleared by the Appointments Committee of the Cabinet chaired by Prime Minister Atal Bihari Vajpayee, official sources said today. Finance Ministry is expected to issue a notification shortly regarding appointment of Reddy, a retired IAS officer of 1964 batch. However, the date for Reddy to assume his new assignment is yet to be decided. They held protest against the ‘black’ letter issued by the Registrar, Cooperative Societies, Punjab, vide which pay scales of the employees of the banks had been ordered to be reduced. Mr S.K. Bhanot, press secretary, said a pen-down strike would be observed by all branches of the banks on July 23. The Foreign Investment Promotion Board (FIPB) has cleared Motorola’s long-pending application to undertake wholesale marketing and cash and carry stocking and sale of goods in accordance with current import/export policy. The New York Stock Exchange — listed and city — headquartered firm, however, posted a 43 per cent and 29 per cent jump in net profit and revenues, respectively, compared with the corresponding April-June quarter of the previous fiscal. 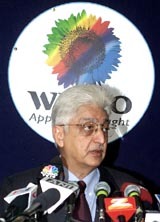 Speaking at a news conference, Wipro Chairman Azeem Premji said for the quarter ending September 2003, the company expects its revenue from its global IT services and products segment, which also includes revenue from IT-enabled services business as of June 30, 2003, to be about $ 210 million. Wipro’s global IT services and products revenue increased 46 per cent year-on-year, at Rs 925.5 crore. A steep decline in technology shares on Nasdaq and not-so-encouraging Q1 results took its toll on share prices, mainly IT counters, with the sensex resuming sharply lower at opening session on the BSE today. Meanwhile, Wipro’s Shareholders approved a cash dividend of Rs one per equity share in the AGM yesterday. Premji said the company’s strategy of becoming a comprehensive IT solutions provider is beginning to be reflected in its operations and operating results but added that the recent appreciation of the rupee against US dollar has added a new challenge since the majority of its revenues are in dollars and a significant part its costs are in rupees. IT major NIIT yesterday reported a consolidated profit after tax of Rs 3.4 crore for the quarter ended June 2003 as against a loss of Rs 1.3 crore in the corresponding period a year ago. NIIT’s global system wide revenue, including NIIT Education and NIIT Technologies, was pegged at Rs 230.6 crore for the third quarter (April-June 2003) as against Rs 193.1 crore registered in the year-ago period. Commenting on the company’s performance, Rajendra S. Pawar, Chairman of NIIT, said “The third quarter performance was supported by a good revenue growth in the IT services”. Asian Paints (India) Ltd is planning to turn around its loss making international units and expects the overseas business to contribute over 21 per cent of the consolidated revenue in fiscal 2003-04. The company would focus on turning around five of its loss making units and on improving the performance of profitable units by maximising efficiency and supply chain and better working capital management, Asian Paints (India) Executive Chairman Ashwin Choksi said at the annual general meeting here today. The emerging markets offer significant growth opportunities, he said adding, Asian Paints through its subsidiaries has 23 manufacturing facilities in 22 countries. Company sources said the units in Sri Lanka, Bangladesh, Mauritius, Oman and Australia were loss making. Raymonds reported a robust 385 per cent rise in its net profit at Rs 20.92 crore during the first quarter ended June 30, 2003, over Rs 4.31 crore in the same period last fiscal. Net sales grew by 11.2 pc during the April-June period at Rs 185.50 crore as compared to Rs 166.70 crore in the last fiscal. The company, which plans to get aggressive in the FMCG sector, has put Binaca toothpaste launch on the backburner, shelved plans to enter packaged water business and plans to launch several OTC healthcare brands as means for achieving growth over the next few years. MUMBAI: The Reserve Bank of India (RBI) under Section 22 of the Banking Regulation Act 1949 rejected the licence application of the Darbhanga Central Cooperative Bank in Bihar to carry on the banking business. REDMOND (WASHINGTON): Microsoft Corp has said its net profit soared 26 per cent in the April-June quarter, driven by higher sales. Net profit in the three months climbed to $ 1.92 billion or 18 cents a share, from $ 1.53 billion profit last year or 14 cents a share in the three months, it said yesterday. CHENNAI: Hutchison Essar today announced that it would invest Rs 200 crore this year for enhanced network coverage here, its CEO (South) Sandip Das said here today. NEW DELHI: Bharat Sanchar Nigam Limited (BSNL) today signed a Memorandum of Understanding (MoU) with Sri Lanka Telecom (SLT) to examine the business, technical, regulatory, legal and other aspects for establishing link between the two countries. NEW DELHI: The LPG gas users of Kottayam district of Kerala have submitted a memorandum to the Union Ministry of Petroleum and Natural Gas demanding the establishment of a LPG bottling plant in the district.